The California Spangled Cat is a breed of cat that was bred to resemble spotted wildcats, like the ocelot and leopard. They were originally bred in the 1980s and were only ever a rare breed, and were usually expensive. 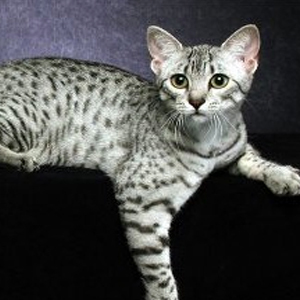 The popularity of two other spotted cats breeds- the Ocicat and the Bengal- overshadowed their development. Inspired by the poaching death of a leopard, the anthropologist Louis Leakey motivated Californian Paul Arnold Casey, Jr. to breed a domestic cat resembling a small leopard, and that this would emphasize how important it is to preserve the leopard. Casey died April 23, 2007 in Los Angeles, California. He was 60 years old.